This old Knoxville Railway and Light Company Uniform was worn by my great, great, grandfather, Henry Dallas Harrington in 1915. He died of pneumonia while running a streetcar on 6th Avenue in 1915. My grandfather, John E. Harrington passed this on to my father, John R. Harrington. After my father died, he passed it onto me. While I could not find a picture of Henry Dallas in the uniform, I did found an undated family portrait taken prior to 1915. Henry Dallas is seated with his family. My great grandfather William Walter is on his left knee in the dark colored suit. 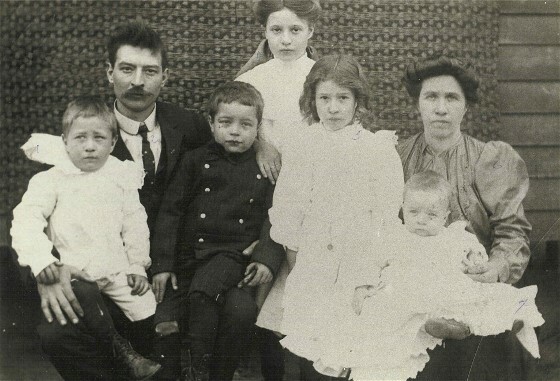 Henry Dallas Harrington with his family. Henry wore the uniform while working on his job as a street car conductor in Knoxville, Tennessee. Streetcars were introduced to Knoxville in 1876 and for nearly 75 years was the city’s form of urban mass transportation. 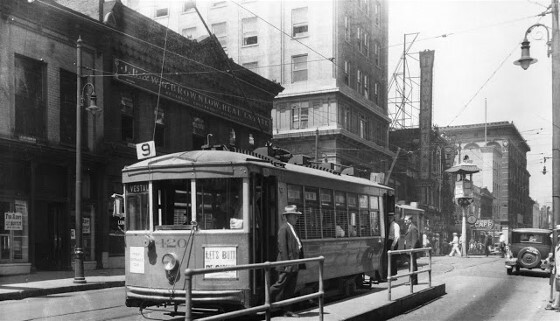 Streetcars allowed the city to expand where citizens lived and worked. Knoxville grew from a small agricultural market town of about 9,600 in 1880 to a bustling little city of about 36,000 in 1910. As the city grew, so did dust, noise and soot. Many of the citizens desired to get away from the “city life.” Streetcars made it possible for them to live in the suburbs and work in the city of Knoxville. Kirk Harrington’s great, great, grandfather Henry Dallas Harrington, was a streetcar conductor by trade. This uniform, now a treasured heirloom of the Harrington family, has also been a city heirloom and displayed at Knoxville City commemorative events. We love cleaning, restoring and preserving heirloom garments of all kinds. 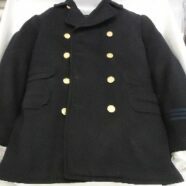 The uniform consisted was made of dark navy wool, and was three pieces, including an overcoat, vest and pants. All were in fair condition when we received them. All items had corroded brass buttons. The jacket was missing one of it’s lapel buttons. The pants and vest had corroded cinch buckles and the jacket had a corroded hanging chain at the collar. The wool on all items had insect damage. There were “repaired” areas on the pants. The lining on the pieces was moldy and tattered. We carefully cleaned the uniform several times using a wool method. We polished and hand cleaned all the brass buttons. Some of them had a deep black discoloration or residue on them that we were not able to completely remove. We removed the rust on the metal buttons the best that we could and re-painted them with a metal paint. We sewed the lining of the coat in several areas as well as several small holes on the outside that could be repaired. The seams in the pants were very fragile and had come undone in several spots so we repaired those. We repaired the pockets and facing in the pants. We repaired what could be repaired in the vest as well. We re-washed the lining of the pants and the vest to remove as much of the dirt as we could. We did not fasten any of the buttons or clamps for the preservation so that it would not stress the material any further. 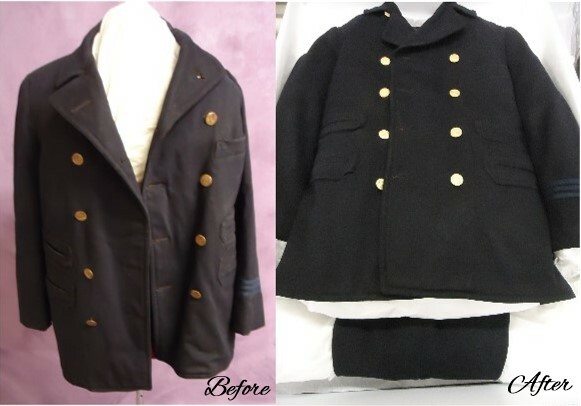 After all uniform restoration was done we gave it a museum quality uniform preservation in an acid-free and lignin free box. This will help protect it from any further damage. We thoroughly enjoyed having Kirk’s uniform in our shop and were very sad to see it go. We have no doubt this treasured heirloom uniform will continue to bring a sense of nostalgia and history to the Harrington family. Do you have a treasured heirloom garment that needs uniform preservation? Don’t delay it’s care. Order heirloom garment preservation today.